The first batch of 13 direct recruits NE Police Sub – Inspectors joined Delhi Police. This was informed by Mr Robin Hibu, IGP, Nodal Officer for Northeast People based in Delhi. Mr Hibu expressed in his communication ” With great pride and satisfaction, I want to share good news that 13 officers (two lady officers), have joined Delhi Police and they are under going practical field training in different sensitive police stations of Delhi. Today, I had 2 hours interaction with these pioneers of officers from NE states, who will be serving capital of India donning Delhi Police uniform with four shinning stars on their pride shoulders”. 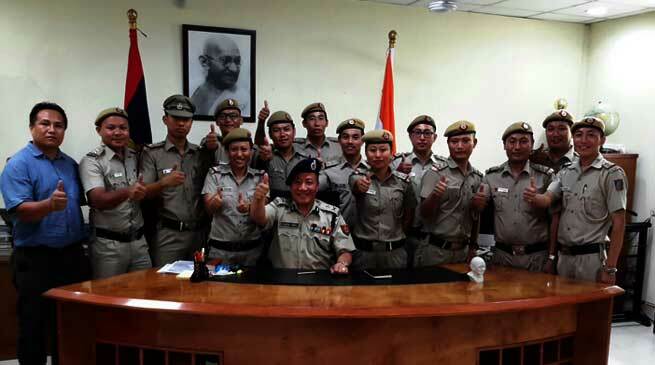 Mr Hibu told them to go through grilling real policing practices with smile and pride, thanking Lord for giving such blessing to be in the heart of India….to serve and to protect, also told them to learn Hindi, Haryanvi, Punjabi languages which will help them to connect with the poorest Delhites, to behave exemplarily as first officers of batch from NE states, to choose best wives and husbands after proper introspection, who can adjust with tough police life. This is in addition to 436 constables (NE boys & girls) by special recruitment for NE youth in all 8 NE states by Delhi Police, who are undergoing training at police training schools at Delhi. Pray and bless these promising 436 + 13 NE youth who are joining me in the service of people of Delhi and NE people in particular, Expressed Mr Hibu .